The “Grand” as it is called on the island, is a historic coastal resort with a spectacular 660-foot long, three-story high porch. Below this covered veranda is a manicured lawn sloping down to a formal flower garden where 10,000 geraniums bloom in season among other flower beds with wild blossoms. The hotel is located on Mackinac Island which is in the straits between Lake Michigan and Lake Huron. It has thrived because of an important decision made in the 1920s. All private cars and trucks were outlawed on the island which gives visitors a chance to live in a village without automobiles. In their place, islanders depend on bicycles and horse- drawn carriages and wagons. Originally called Plank’s Grand Hotel after its builder John Oliver Plank, one of America’s top hotel builders and operators in the late 1880s and early 1900s. 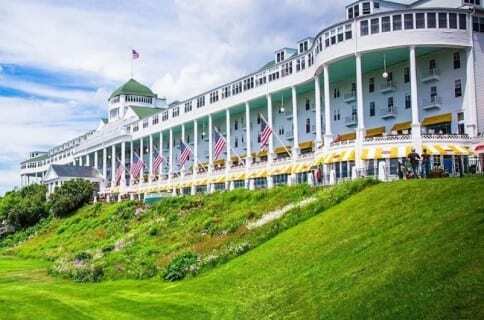 In 1886, the Michigan Central Railroad, Grand Rapids and Indiana Railroad, and Detroit and Cleveland Steamship Navigation Company formed the Mackinac Island Hotel Company. The group purchased the land on which the hotel was built and construction began, based upon the design by Detroit architects Mason and Rice. When it opened the following year, the hotel was advertised to Chicago, Erie, Montreal and Detroit residents as a summer retreat for vacationers who arrived by lake steamer and by rail from across the continent. The hotel opened on July 10, 1887 and took a mere 93 days to complete. The Grand has managed to maintain its 19th century charm and to survive into the age of budget hotels, interstate highways and recreational vehicles. It offers a rare level of luxury with a sense of style that has mostly gone out of style. The meals are American plan featuring five- course breakfasts and formal dinners with jackets and ties on gentlemen and ladies “in their finest”. No tipping is permitted at the Grand with an 18% gratuity charge added to every bill. Five U.S. Presidents have visited: Harry Truman, John F. Kennedy, Gerald Ford, George H.W. Bush and Bill Clinton. The hotel also hosted the first public demonstration of Thomas Edison’s phonograph on the porch and regular demonstrations of other new inventions were often conducted during Edison’s frequent stays. Mark Twain also made this a regular location on his speaking tours in the midwest. Additionally, six suites are named for and designed by seven former First Ladies of the United States, including the Jacqueline Kennedy Suite (with carpet that includes the gold presidential eagle on a navy blue background and walls painted gold), Lady Bird Johnson Suite (yellow damask-covered walls with blue and gold wildflowers), Betty Ford Suite (green with cream and a dash of red), Rosalynn Carter Suite (with a sample of china designed for the Carter White House and wall coverings in Georgia peach), Nancy Reagan Suite (with signature red walls and Mrs. Reagan’s personal touches), Barbara Bush Suite (designed with pale blue and pearl and with both Maine and Texas influences) and the Laura Bush Suite. In 1957, the Grand Hotel was designated a State Historical Building. In 1972, the hotel was named to the National Register of Historic Places, and on June 29, 1989, the hotel was made a National Historic Landmark. The Conde Nast Traveler “Gold Lists” the hotel as one of the “Best Places to Stay in the Whole World” and Travel + Leisure magazine lists it as among the “Top 100 Hotels in the World.” The Wine Spectator noted the Grand Hotel with an “Award of Excellence” and it made Gourmet magazine’s “Top 25 Hotels in the World” list. The American Automobile Association (AAA) rates the facilities as a Four-Diamond resort. In 2009 the Grand Hotel was named one of the top 10 U.S. Historic Hotels of America by the National Trust for Historic Preservation. In 2012, the Grand Hotel celebrated its 125th anniversary with a series of memorable events: Saturday night dinner with former Michigan governors in attendance, presentation by Grand Hotel interior designer Carlton Varney, Friday night fireworks, live performance by John Pizzarelli and much more. A special edition 125thanniversary coffee table book was published. 2018 marks the Grand Hotel’s 131st Birthday and over 85 years of Musser Family’s ownership. 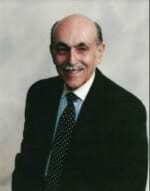 The author, Stanley Turkel, is a recognized authority and consultant in the hotel industry. He operates his hotel, hospitality and consulting practice specializing in asset management, operational audits and the effectiveness of hotel franchising agreements and litigation support assignments. Clients are hotel owners, investors and lending institutions. All of these books can also be ordered from AuthorHouse, by visiting stanleyturkel.com and by clicking on the book’s title.